The first half of 2016 has been a roller-coaster for financial markets. A combination of uncertainties surrounding the U.K.’s vote to leave the European Union and weaker-than-expected corporate earnings results across the region means a tough second half looms. European banks, in particular, have had a very tough six months as the shock and volatility around Brexit sent banking stocks south. Major European banks like Deutsche Bank and Credit Suisse saw their shares in free-fall after the referendum’s results were announced. In the U.K., RBS was the worst-hit, with its shares plunging by more than 30 percent since June 24. Buried in the Liberal Federal Budget that was introduced on March 22, 2016, under Chapter 8 – Tax Fairness and a Strong Financial Sector, was a section titled “Introducing a Bank Recapitalization ‘Bail-in’ Regime.” Simply stated, in the unlikely event of a large bank failure, the Government proposed it would reinforce that bank shareholders and creditors are responsible for the bank’s risks – not taxpayers. What that means is that shareholders, bondholders and depositors, rather than taxpayers, are responsible for the bank’s risks in the event of a failure. During the 2008 global financial crash, banks that were deemed “too-big-to-fail” were bailed out by the government, meaning the taxpayer footed the bill. None of the banks were Canadian banks, but it does need to be noted that Canadian banks received some $114 billion from Canada’s federal government. This was against the background of Canadian banks being declared “the most sound banking system in the world.” At the time, the government denied there was any bailout, preferring to use the term “liquidity support.” To put the amount in perspective, $114 billion is roughly 7% of Canada’s GDP. 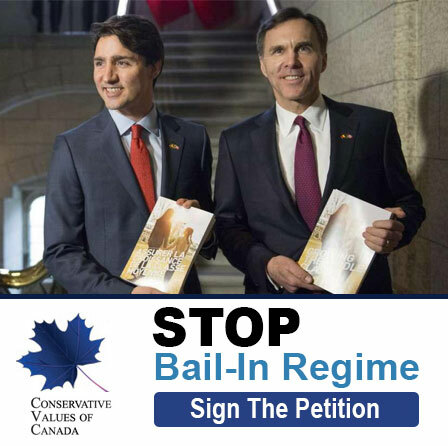 On June 22, 2016 Bill C-15 became law along with its controversial “Bail-In Regime”. In the crash of 2008 governments “bailed out” banks with billions of dollars. The next time around banks will be permitted to seize your deposits and exchange them for shares, shares in a failed bank. Some say that Canadian banks are so strong Canadians don’t have to worry. But the experts say “Canada is in Serious Trouble”. DBRS, Moody’s and Standard and Poors all have downgraded Canadian banks to a “negative” outlook. The Bank of Canada says our housing market is 30% overvalued, Deutsche Bank says 63% and CMHC says 35%. With average house prices now over $1.3 million in Toronto and Vancouver, a crash appears imminent. Canadian banks have over $1 trillion invested in residential mortgages. If values come down, banks could easily find themselves under water at which time they will be permitted to take your hard earned deposits to pay their debts. Deposits under $100,000 appear to be covered by CDIC insurance but anything above, personal or business, will be fair game for the bail-in. (2.‍3) An order made under paragraph39.‍13(1)‍(d) gives the Corporation the power to convert, or cause the federal member institution to convert, in whole or in part — by means of a transaction or series of transactions and in one or more steps — the institution’s shares and liabilities that are prescribed by the regulations made under subsection (10) into common shares of that institution or of any of its affiliates.